I bet you all have seen fermentation on a lot of food products in your local grocers and wondered is this something I should be eating slash drinking? Well the answer is yes! These foods have quite a few health benefits that can help you further your health and fitness journey to the utmost. This is a chemical process in which glucose is being broken down anaerobically. In food science they are basically leaving the food to sit and step until the sugars and carbs become bacteria-boosting agents. Fermentation of vegetables is also a good way to store them for a longer period. The consumption of fermented foods will increase your probiotic intake thus leading to growth of “good” bacteria in your gut. This microflora that the foods contain create a protective lining in the small intestines and shields it of pathogens. Consumption of these foods also leads to an increase of antibodies and a stronger immune system. In addition to this they can help to regulate the appetite and reduce sugar and refined carbohydrate cravings. They have the ability to ease the digestive discomfort of having too much or too little stomach acid production. When the stomach has too much acid production the foods can help protect the stomach and lining of the intestines. On the other hand when there is not enough being produced these foods can help increase the acidity of gastric juices. This is a neurotransmitter that facilitates the transmission of nerve impulses which in turn will help the digestive system to run smoothly and in turn can help those that have a hard time going to the bathroom. Basically in a nut shell they can be used as a natural digestive aid instead of your over the counter medicines. First and foremost they are known to help with pancreatic function.When fermentation occurs it has already broken down the carbohydrates therefore it puts less of a burden on the pancreas unlike ordinary carbohydrates. Many pathogenic bacterias cannot survive in acidic environments. With an addition of these fermented foods into your diet they will add to the acidity of your digestive system thus killing these bacteria while adding “good” bacteria. These “good” bacteria then have a sort of take over in your digestive system and inhibits bad bacteria from growing. Kefir- is a fermented milk product that is the consistency of a milk and yogurt mix. It is high in vitamin B12, calcium, magnesium, vitamin K2, biotin, folate, enzymes, and probiotics. Kombucha- this is a fermented tea whether it be black or green. After it has undergone the fermentation process it becomes carbonated and contains vinegar. It is abundant in B-Vitamins, Probiotics, Enzymes, and acids( acetic, gluconic, and lactic). It improves digestion, aids in weight loss, increases energy, detoxes the body, supports the immune system, prevents cancer, and can reduce joint pain. 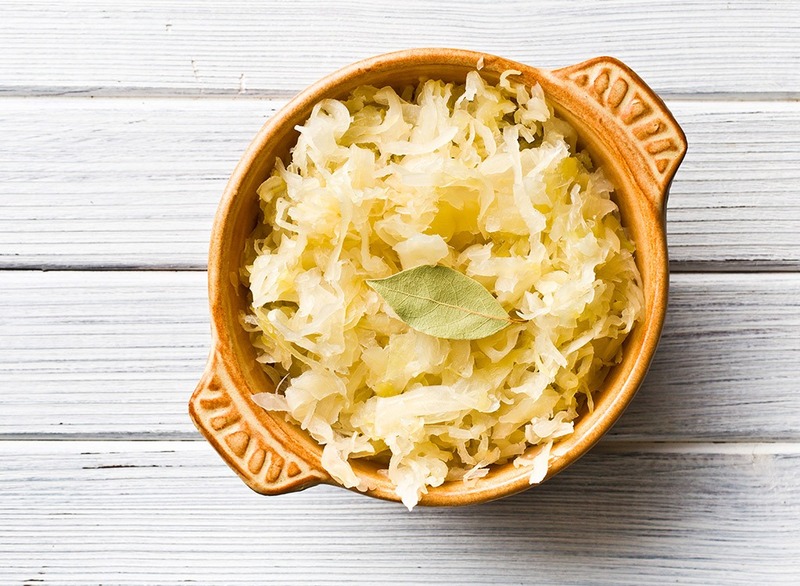 Sauerkraut- this is fermented cabbage high in fiber, vitamin A, vitamin C, vitamin K, and B vitamins. It is also noted to be high in iron, copper, calcium, sodium, manganese, and magnesium. It is beneficial to boosting the digestive system health, aids in circulation, fights inflammation, strengthens bones, and reduces cholesterol. Pickles- these have been an american staple for awhile now but don’t just reach for your typical claussen or vlasic jar opt for companies that use organic ingredients or local farmers in your nearest health food stores. These guys contain a lot of vitamins and minerals but one to truly note is its high quantity of vitamin K.
Kimichi- a fermented Korean dish made of vegetables mostly cabbage and spices. It is said to have a great affect on improving cardiovascular and digestive health. Lastly its high content of antioxidants that reduce the risk of chronic disease. Fermented Vegetables- like kimchi but use of other vegetables such as radish, carrot, tomatoes, onions, etc. Raw Cheese- these are cheeses made with milk that has not been pasteurized. Most commonly these are known as your goat and sheep cheeses. They are most known for their probiotic properties. Benefits of these are increasing gut health, boosting the immune system, and destroying harmful bacteria. Yogurt- a fermented dairy product. Look for those that again come from sheep or goat, organic, and that are grass fed. Yogurt is most well known for having a great amount of probiotics. With several types of ways to incorporate fermented foods into the diet you should be off to a great start just by adding in a little at a time to each meal throughout the day. This could be adding kefir to your breakfast cereal or oats, drinking on a kombucha throughout the day, or even adding a little kimchi or kraut to your next salad!